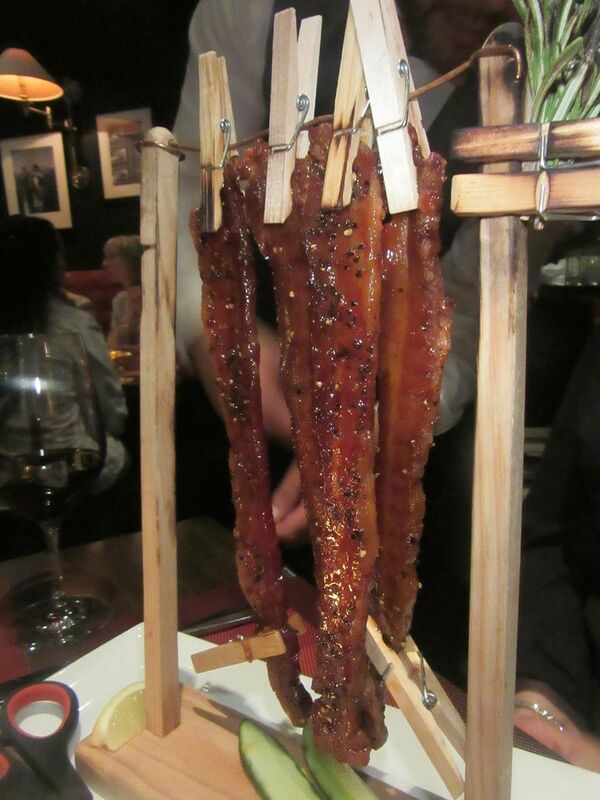 David Burke fans cannot resist candied bacon on a clothesline with dill pickle. And why should they? 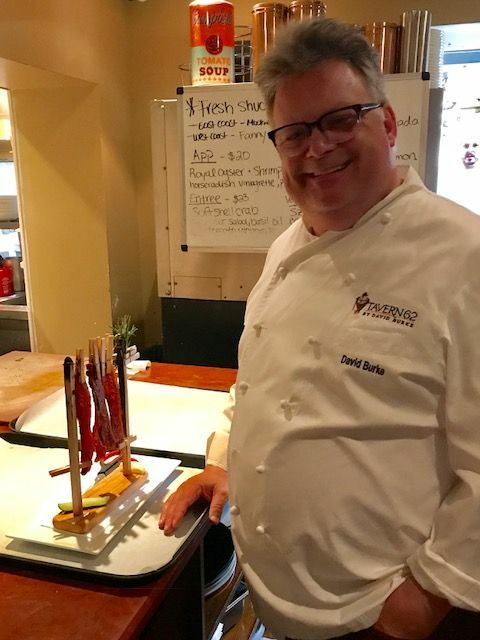 “Years pass and chefs mature, but there’s no need to fret that David Burke might grow stodgy,” I wrote in Manhattan magazine, when the notorious trickster opened Tavern62 by David Burke in his old Fishtail playpen. 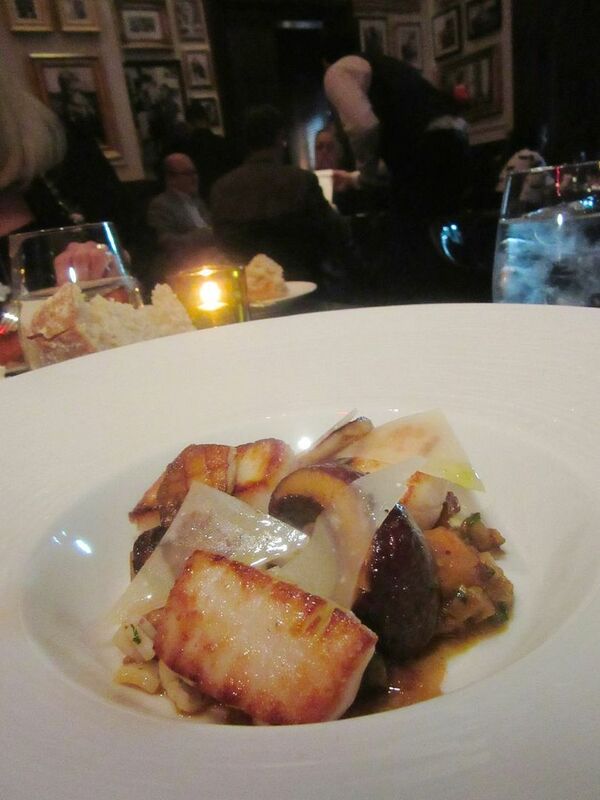 My niece Dana Stoddard catches the chef at the kitchen downstairs willing to pose with his signature creation. The irrepressible chef who dreamed up the numbered swordfish chop and trademarked salmon pastrami was baking Boston brown bread with raisins and jalapeño corn bread in tin cans and sending them in perfect circles to the table in a silver toast holder with red pepper jam. Not all these early stunts survive months later. But the eating is better than ever. And the serving crew is more reliable. 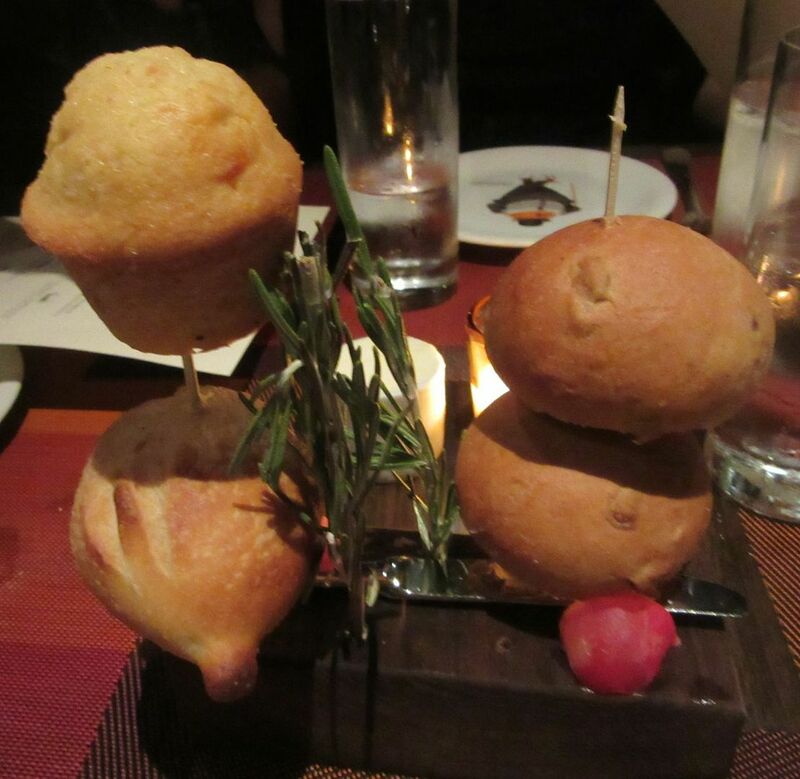 Breads baked in tin cans have evolved into rolls and muffins impaled on sticks. 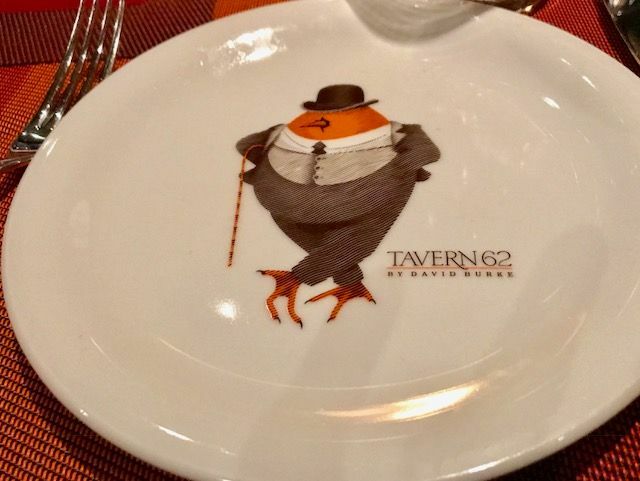 That’s an egg with chicken feet dressed as Boss Tweed on the new service plates for a Tavern feel. 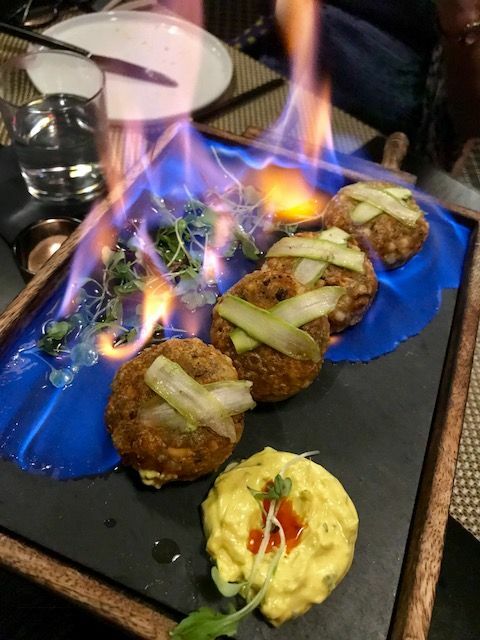 Now the waiter brings sourdough rolls, rye bread rounds, and jalapeño cornbread muffins impaled on sticks with radish chunks, and butter in a cup rather than on slabs of Himalayan salt. That’s an egg with chicken feet dressed like Boss Tweed on the new service plates. 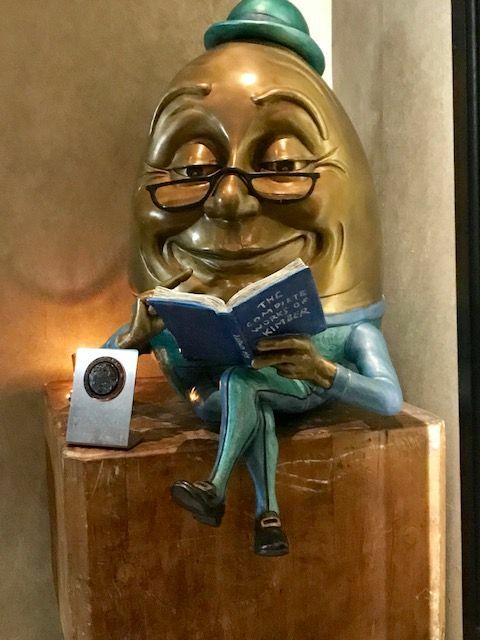 Another egg, a large bronze Humpty Dumpty, sits at the top of the stairs leading to the dining room. Another egg, this one Humpty Dumpty, sits at the top of the stairs leading to the dining room. The crunchy, caramelized maple-syrup bacon strips hanging on a clothesline with slivered pickles below are the signature must-have here. They look like gallows to me as waiters crisscross the room delivering the bacon. The construction comes with scissors. Cut yourself a piece of bacon, and then another. 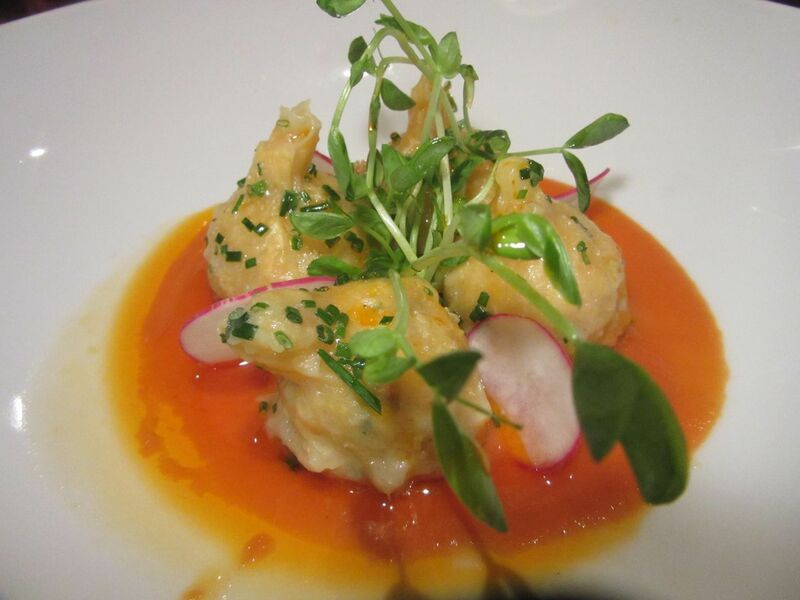 Angry Lobster dumplings in a sauce of tomato, basil and lemon confit, expensive at $21 but delicious. Brand new menus with little drawings of pigs and ducks and assorted fish recently arrived. The angry lobster scramble with slightly too cooked eggs is gone. Maybe it was just too fiery for summer’s global warming. I’m just as happy tonight dividing a quartet of angry lobster dumplings sauced with spicy tomato-and-confit’d lemon even though it means I only get one luscious little roll-up for myself. 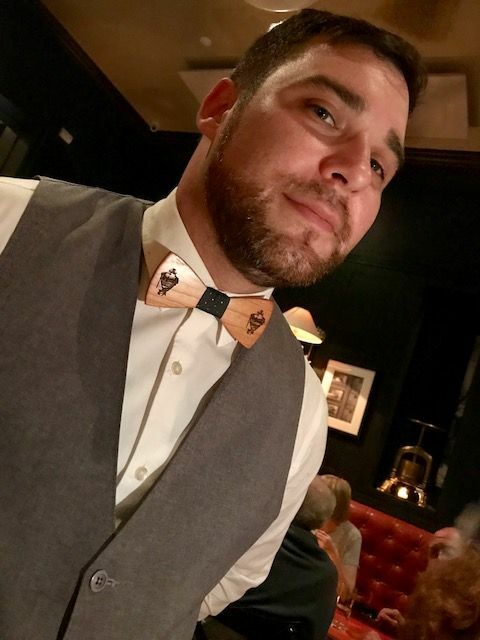 Photographer Dana Stoddard captures the waiter’s wooden bow tie with Tavern imprints. Does $21 seem a stiff price for these little doodads? Prices are creeping up all over town, I notice. Appetizers ranging from $16 for the sprawling asparagus and mushroom flatbread to $22 for the crab cake, and entrées $28 to $48 and $65 for a Himalayan salt brick-aged bone-in strip remind me it’s 2017 and I’m perched on tufted copper-colored leather in midtown Manhattan. I find the crab lost in its pretzel stockade but the friend who ordered it disagrees totally. To me, the crab seems overwhelmed by its stiff girdle of pretzel sticks with Old Bay tomato jam, but the friend who ordered it is delighted. I don’t mind the smoked trout dominating the almost classic Caesar. And the chef’s new octopus invention is a triumph. 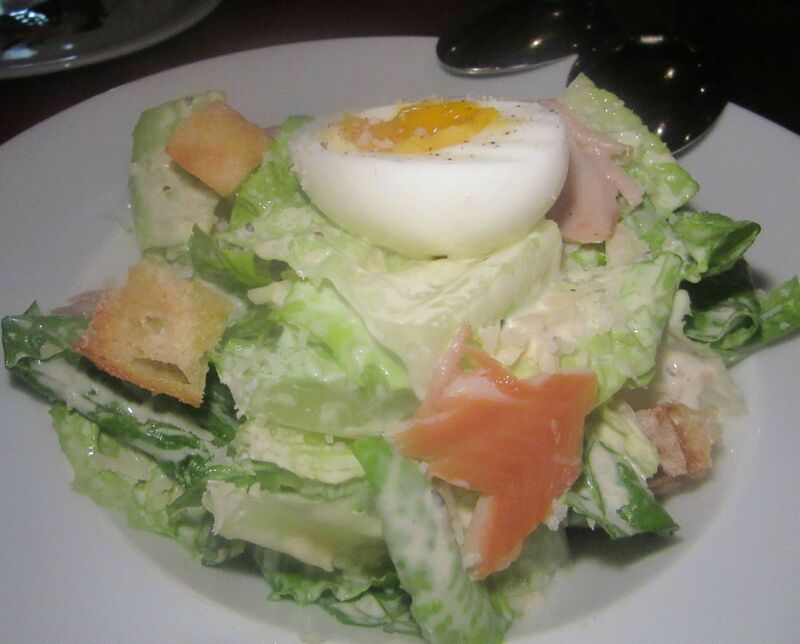 The smoked trout Caesar is tossed with croutons and parmesan and topped with soft egg. 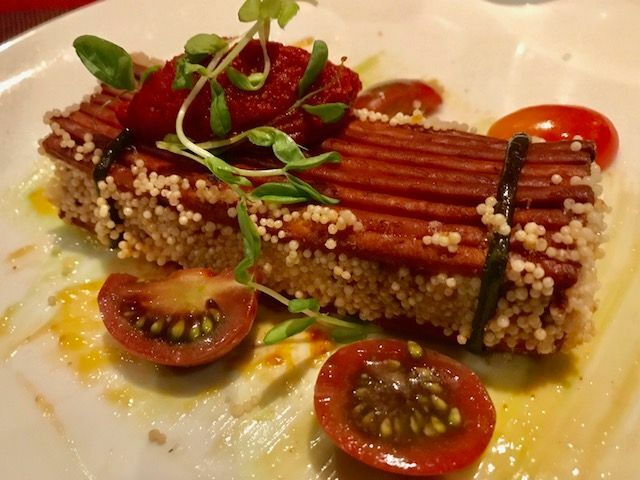 I imagine Burke had fun dreaming up the new octopus-chorizo presentation. It’s good. I had it twice. 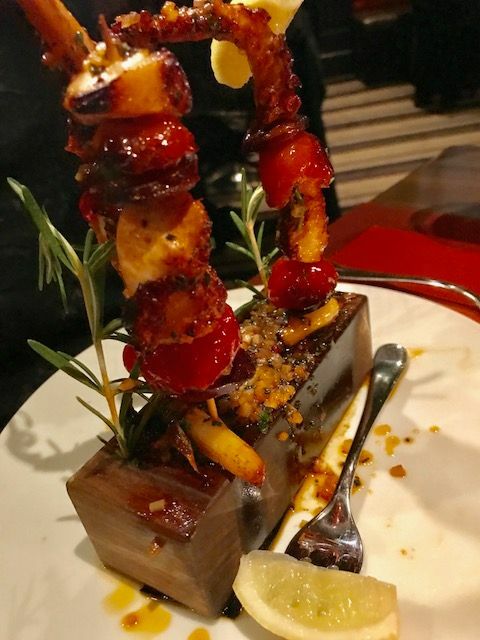 Blackened octopus and chorizo kebabs with cherry tomatoes ride on a duo of standup skewers stuck into a wooden brick, with a garlicky olive sauce below to drag them through if you wish. Stylish, tender, full of flavor, enough for four who enjoy sharing. 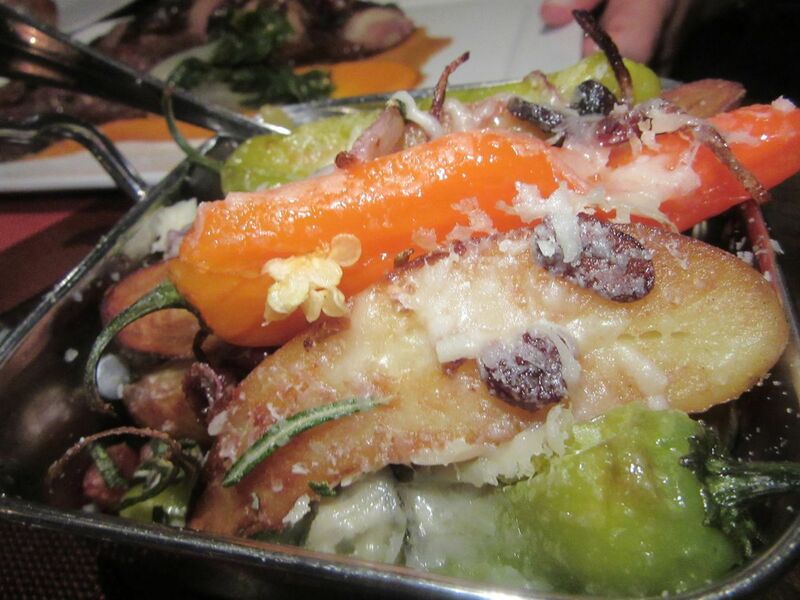 A side of potato fingers is layered with bacon, cheese, carrots and shishitos. 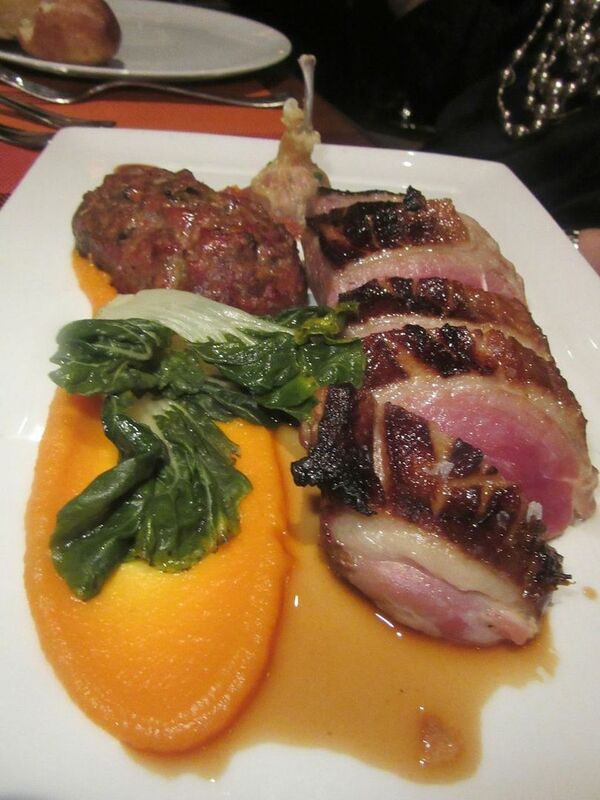 “Duck, Duck, Duck” features slices of meaty rare breast, a meatloaf of legs and the liver in a beggar’s purse. Portions are definitely generous. Choose Duck, Duck, Duck and as advertised, the bird arrives in three modes: several slices of rouge-red breast, a meatloaf of the leg, and a little beggar’s purse of foie gras with a bone as a handle. You might want to scrape the fat away for a taste of the skin as I do, or just cut the meat free. If I’d asked for it medium rare instead of “really rare,” it might have been less chewy. 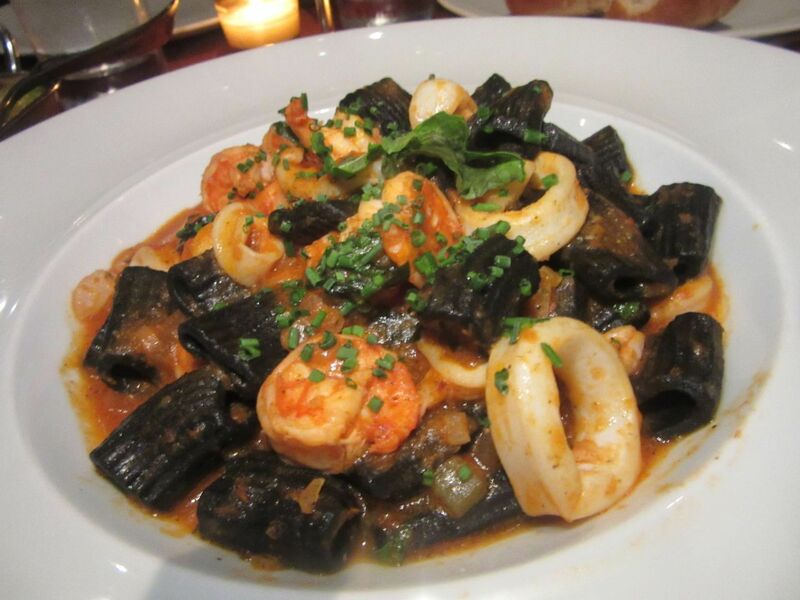 Black rigatoni with shrimp and calamari is sauced with tomato and lemon. Ginger and pepper crusting gives more flavor than usual to salmon with golden beet tartare alongside. 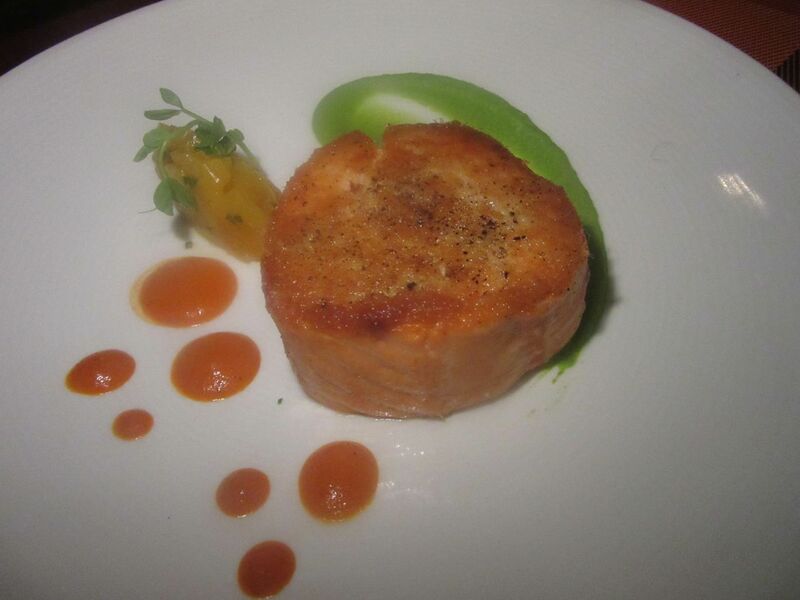 The inevitable salmon is more complex than most about town, deliciously molded into a ginger-and-pepper-crusted round served with chickpea purée, Fresno chile, and a hill of golden beet tartare. (The menu says tartare, but actually the beets are cooked.) Black rigatoni with shrimp and calamari in a spicy tomato and lemon sauce would not be my first choice here. It’s good, but everything else is better. Only two of us even taste it. 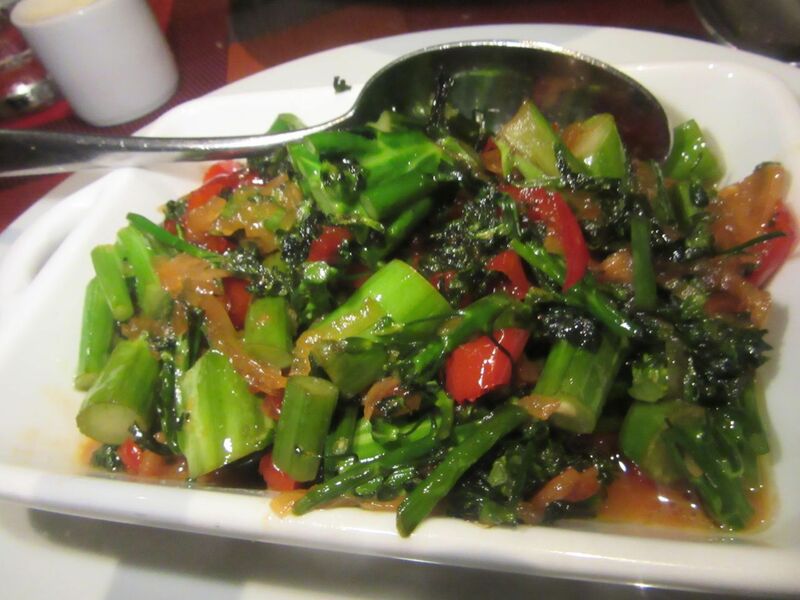 Broccolini with peppadews may be a desperate grasp for a few healthy bites. I like to think that a $12 side of broccolini (with peppadews for accent) can protect undisciplined eaters on evenings of excess. A second extra tonight, potato fingers layered with bacon, cheese, and shishitos, should cancel any broccolini benefits. Scallops benedict with bacon and quail eggs gets a wonderful corn flavor from the johnnycakes. The waiter comes by to snip chive on my nephew Gabriel’s Caesar. 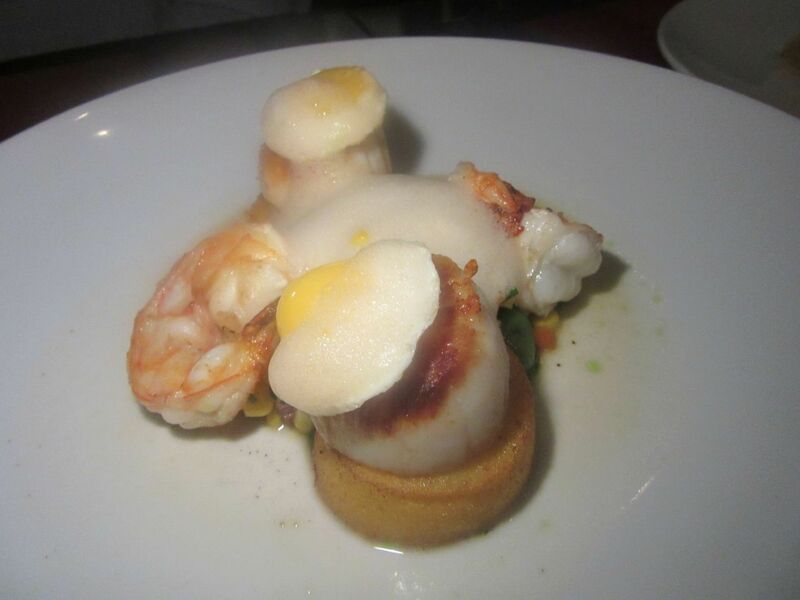 We focus on finishing off the fabulous scallops and shrimp benedict on johnnycakes with bacon, corn and fried quail-egg hats. Having been hopelessly smitten months earlier with the flamboyant Peking pork shank presented in a giant round of wildly crusty skin with a sturdy knife standing up in it, I am stunned to see it reduced to a modest cutlet. 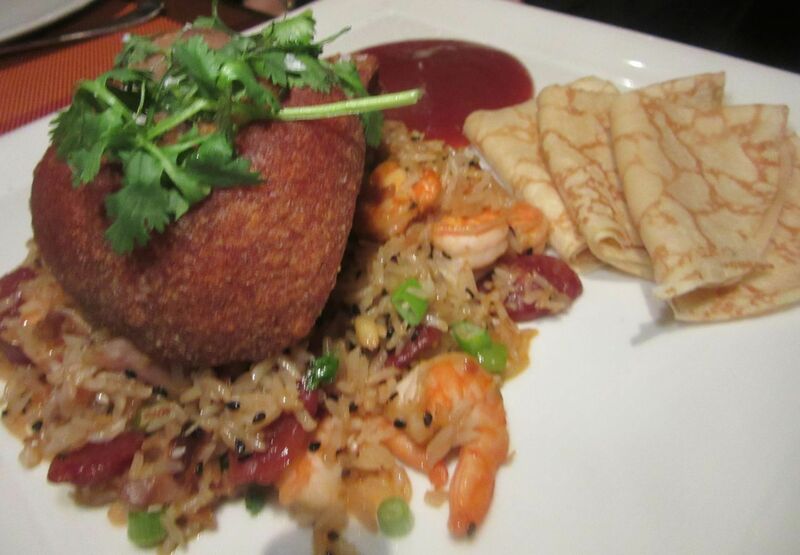 It lies collapsed on shrimp and lap cheong fried rice, alongside folded crepes that had originally come in a steamer. 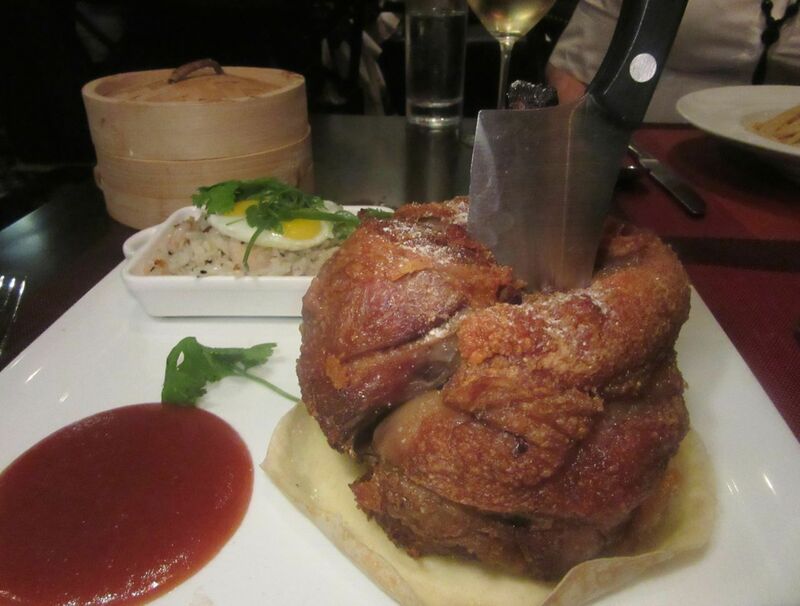 I’m stunned to see my favorite Peking pork shank tamed in response to complaints from Tavern62 customers. This is how the shank used to be served, tender as can be, wrapped in crusty skin, with a knife poised for eating. “What happened?” I challenge Burke as he stops by our table on his tour of the room. Agreed, it’s only a pork shank, and I personally neglected it by not returning for months. “People complained about the fat under the skin,” he confides. “And some said the knife was threatening.” Given recent headlines with madmen brandishing butcher knifes, I suppose the prince of puns felt he had no choice but to give in. Very lemony lemon tart with blueberry pie jam and a drift of whipped cream. Burke fans will save appetite for a sweet finale. Tonight my pals agree I can order one dessert. 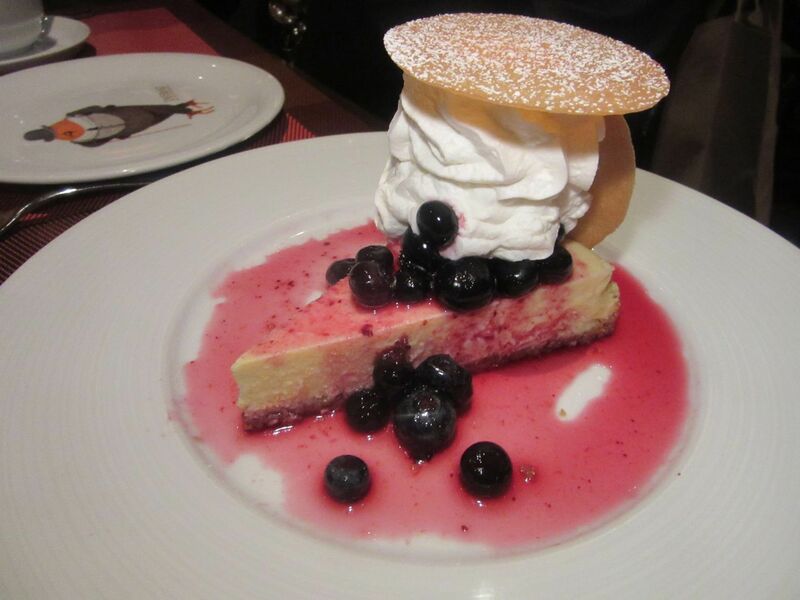 Lemon tart with blueberry pie jam and whipped cream gets the vote. I’m not a whipped cream devotee, but I am a fool for intense lemon curd and this is it. 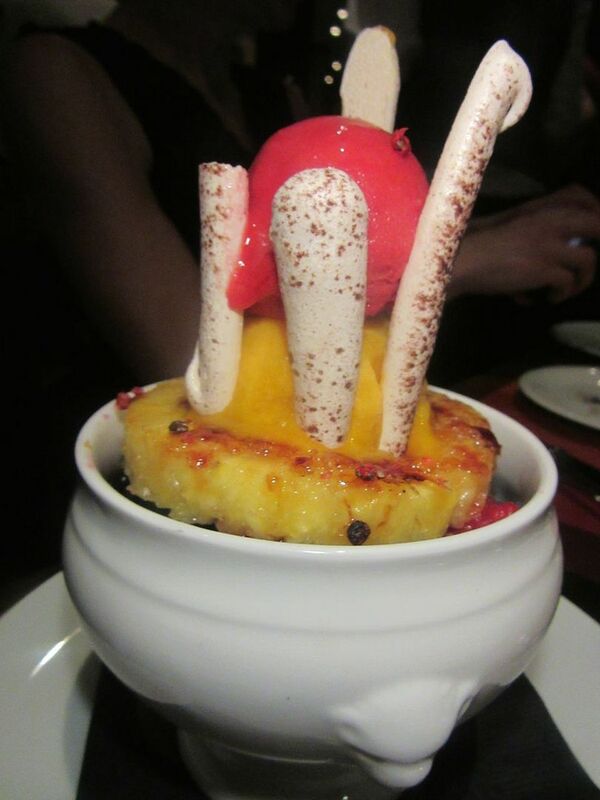 Mango and raspberry sorbets on pineapple brûlée with berries is irresistibly refreshing. Our attempt at discipline is sabotaged as Burke covers the table with desserts. I can ignore the coconut banana cream pie. But I can’t stop eating the mango and raspberry sorbets on pineapple brûlée with berries. It’s wondrously refreshing. Once I’m refreshed, there seems no point ignoring the individual peanut butter, blackberry and vanilla milkshakes with cookies. One cookie? I must taste them all. It’s my job. 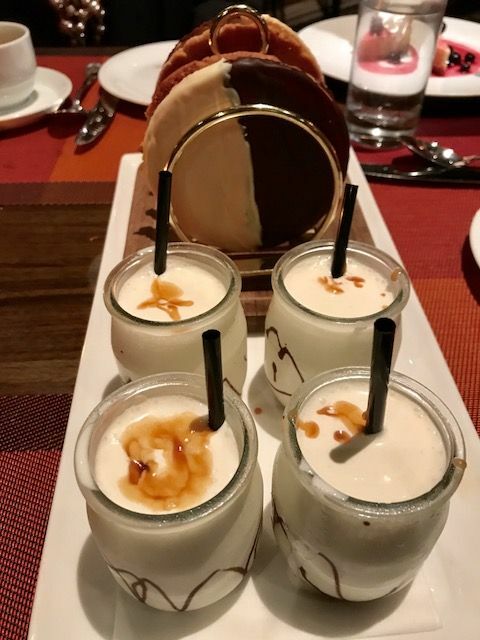 The chef's dreams are not unlike mine: Individual milkshakes and a mix of cookies. Photo by Dana Stoddard. Don’t be put off by rock shrimp remoulade with cheddar and mayo on the burger. 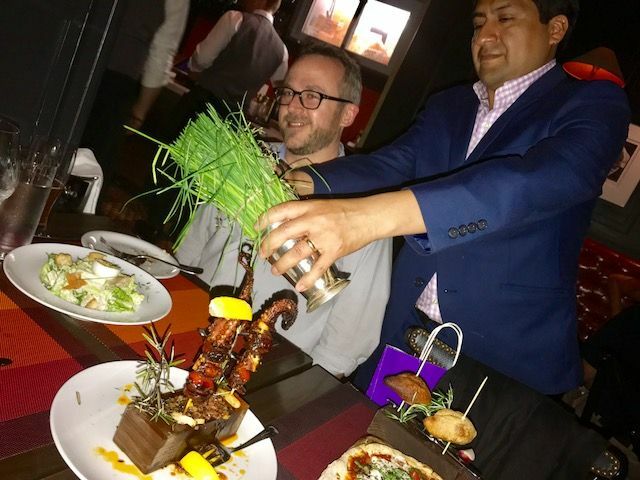 Surf’n turf after all. If I worked nearby I might come in solo for the burger at lunch in the bar where the sconces are black derby hats. The locals have good reason to celebrate Burke’s return. 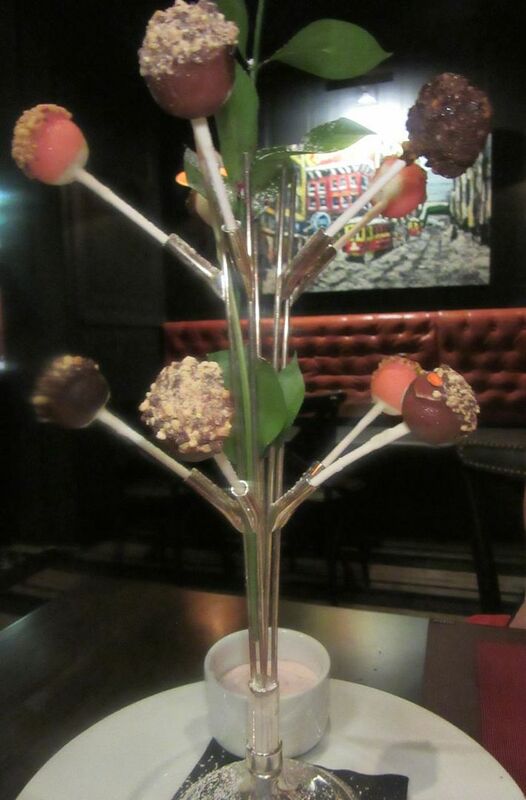 Here are Burke’s trademark cheesecake lollypop truffles. You can order the tree for $22. 135 East 62nd Street between Park and Lexington Avenues. 212 988 9021. Monday to Friday noon to 10 pm. Saturday 5 pm to 10 pm. Sunday 11 am to 9 pm.